World wide repair of Demag, Faun, Grove, Kato, Kobelco, Krupp, Liebherr, LinkBelt, P&H, Tadano, Samsung and more. Specialist in electrical appliances. Knowledge in most of hydraulic systems. We offers world wide services and support, competitive prices and are ready to carry out any requests. Please call: (+47) 917 93 211 for immediately access. 24 Hour World Wide Support & Service. For immediately contact, please call +47 917 93211, or send an SMS with all necessary information, including your E-Mail address. www.mobilcrane.com will then contact you as soon as possible. 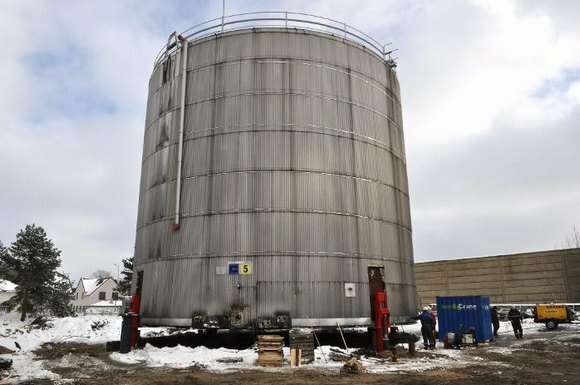 The tank has been lifted to let the SPMT drive under it and take over the load. Cloce-up from the jacking system. This makes it possible to jack without welding in the tank's. The system has been developed by Skailand Kranservice. More pictures will come later. 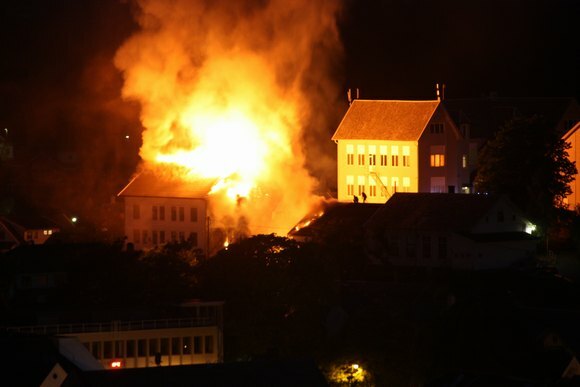 The old school in Flekkefjord did catch fire tonight. No people are known to be hurt. See more pictures HERE PDF (764 kB) - Link to Fædrelandsvennen 's article. 4. Complaint to Rogaland Statsadvokatembeter: The document will not be displayed here, but you may request the document sendt to you. please contact me at post@mobilcrane.com Do not forget to leave your contact information. Enter this link and look into the proceedings between VestKran AS and Skailand Kranservice ANS. New information is added continuously, as the case goes on. (unfortunately the site is only available in Norwegian text). VestKran AS did request the court for an originating summons, in fact two times. 14 November 2007 the 1.st. judgment from Flekkefjord Forliksråd was presented. VestKran AS loses the case. Again VestKran AS request the court for an originating summons. 16 January 2008 the 2.nd. judgment from Flekkefjord Forliksråd was presented. VestKran AS loses the case again. 9 December 2008 the judgment from Lister Tingrett was presented. VestKran AS loses the case once more. However, if you do need any special calculations witch may not be calculated with my product, please contact www.mobilcrane.com for further assistance. The calculator may be downloaded in a Trial-version complete free off charges. 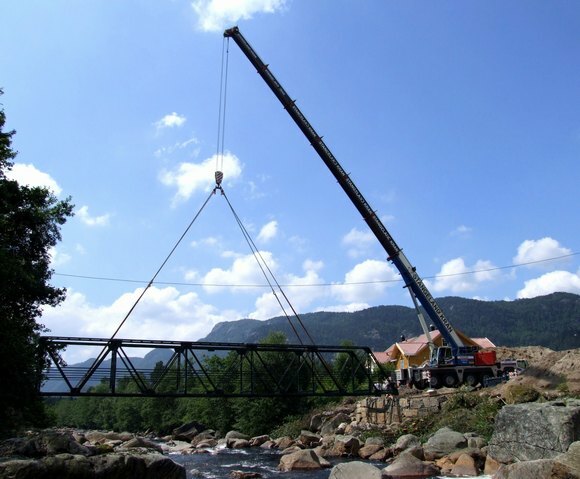 Stangeland Kran AS lifting an old bridge into a new place in Kvinesdal. The bridge has been fully renovated, and will serve as a walkway. I did have the plasure to execute the lifting with the Demag AC 200-1. "Kvina Bridge" is 31 meters long and did have a total weight of 17,4 ton's. No problem for the AC 200. More pictures HERE. 5 Ton Boat Lifting System. 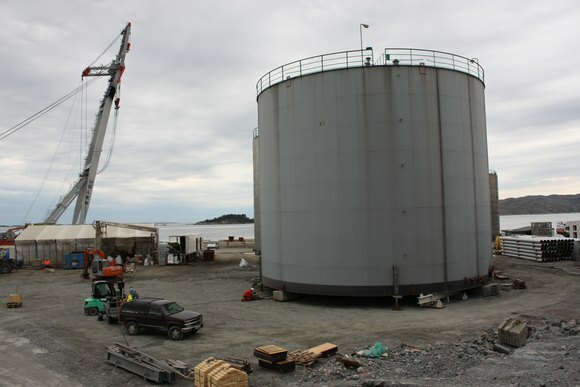 Skailand Kranservice, Flekkefjord, Norway, will from now on be able to handle heavy jacking services. 5 Heavy Duty Jacks, each capable to handle 140 ton, will make it possible to lift heavy colli's, up to more than 500 ton. The system is powered by 7 bar compressed air, and is totaly safe in "E0-zones". For more info, please contact Skailand Kranservice by phone or E-Mail. The Ural 375D, now with 60 meter outrigger on the transporting-frame. Exact load of outrigger is 10,7 ton. From this point, the transport will pass over the "Refsti Bro" and through the "Fedahei tunnel", aproxemately 2,5 km of travel. Enter HERE to see more pictures from the transporting of a Liebherr Towercrane. To assist HSM Steel Structures BV & Eltel Networks AS, in the work on "Fedafjorden Bro", a MOB-boat , "FRC Rubicon" , are now mobilized in Flekkefjord. All work on the suspension-cables, that may create any risk for other traffic, and/or the bridge-project, will be follow-up by the MOB-boat. In cases where the safety is threaten, approaching ships or boats will be warned by VHF, Light Signal & Sirene. Enter the site, and examine how the Earth's Mantle affects to weather and wave motions. This site has now been visited by more than 30000 people (different IP-addresses) from more than 100 nations (122). Enter HERE!, and view the listing. And if your country, of some reason, is missing, please notify www.mobilcrane.com. Add some music to your environment! Check out this site, and listen to the music from Radio Bangkok while your online. A reader of www.mobilcrane.com requested for some more theoretical information in lifting, and this site is intended for this use. Here www.mobilcrane.com will make public crane & lifting theory. Enter the site HERE! Useful Downloads, download and use, free of charges. Now there is several diagrams available for dowloading, all free of charge. Look at "Useful Downloads" in the "Menu" at the left side. By use of these Calculators, you may find the calculations in un/symmetrical loads. Now available, download for free, and calculate all necessary data for lifting un/symmetrical load's. The calculator requires Microsoft Excel in your PC. Lifting in 2 points: Download HERE! Lifting in 3 points: Download HERE! Lifting in 4 points: Download HERE! Demag AC 120, the new generation mobilecrane, with full electronic controll of all movements. Not quite without problems. Read about it in Previous projects, Demag AC 120, defect. Download now for free. Click HERE! Repair by internett and/or telephone, with schematic diagram, JPG format or AutoCad, and/or digital photos. Reconditioning of old systems are one of our specialtys, example the DEMAG TC 600 and Liebherr LG 1200, Panama in Previous project's. Professional repair of mobile cranes, WorldWide. 24 Hour Support. Enter HERE! for more details. Check for available flight's at the KLM, Maersk Air & SAS HERE! commission to USA EXPERTEN, and the journey is taken care of. will be welcome to this site. To contact this web-site, enter HERE! Skailand Kranservice will assist E NIGG in Scandinavia. 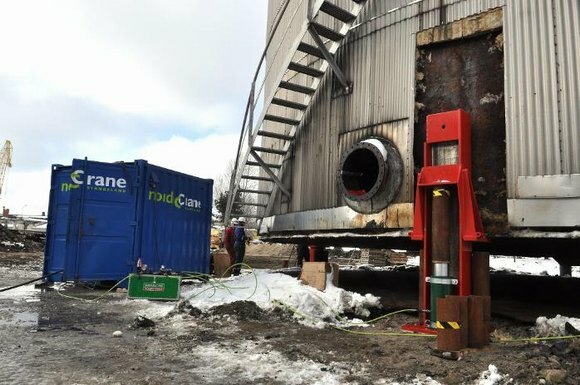 If your company are in need for a cable-crane, please contact Skailand Kranservice by Kenneth Skailand. Enter HERE and visit the special site, all in Norwegian text. The cable-crane at Svinesund, sheck "Previous projects, LTM 1400, at Svinesund" Please enter HERE. You will also find a link to the web-camera at Svinesund bridge. The cable-crane from E.NIGG Switzerland. Skailand Kranservice tok part in the installation of the cable-crane, in the spring 2003. Enter the special site assigned the installation HERE! The new E39 between Flekkefjord and Lyngdal, is now almost finished. All tunnel's are finished, and all new road are completed. The 23 January, the 9 sections for the main span on the "Fedafjorden Bro" will be lifted in position, by the crane-barge "Uglen"
www.mobilcrane.com will follow the finishing of the bridge (And also partisipate in the work), and public the progress at the site, step by step. Enter the site HERE, and stay updated as the road is beeing constructed. The span between the two load-carrying tower's is 331 meters, and the top of both tower's reaches 107 meters over the sea-level. Maximum height for ship's to pass under the bridge will be 50 meters above normal sea-level. Late in Januar 2003, the LMB on a Hitachi KH 300-3, 80 ton's lattice-bom crane broke down, and the problem was located in the loadcell. Enter HERE, and read all detail's. including X-rates.com's " Currency Calculator "
Enter HERE for more details. The 97 4x4 Chevrolet Tahoe is equipped with all necessary equipment for all kind of repair-work. When needed, the 2 ton trailer will carry any spare-part to the site. For Express-Delivery, please contact Skailand Kranservice, and we may serve you. 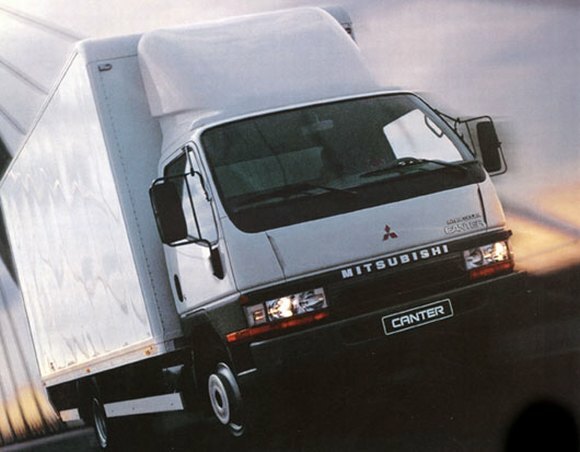 A 94 Mitsubishi Canter will be equipped with all tools, required to do a repair work, independent of where the work will be execute. All power needed for electrical tools, lighting and for example welding, will be produced by a Esab Power Supply. Enter HERE, and read all about the truck. Agreement on co-operation possible & desirable. Get a link to your web-site at www.mobilcrane.com, and join in the top of listing at the search engines like www.google.com - www.altavista.com -search.yahoo.com - aolsearch.aol.com - www.metacrawler.com - search.msn.com - search.kvasir.no - www.kellysearch.com - www.start.no - www.eniro.se - search.virgilio.it - www.mywebsearch.com - ki.mysearch.myway.com - www.hotbot.com - www.mamma.com - 2020search.com - www.dmoz.com - www.a9.com - www.dogpile.com - www.search.sify.com and more. For more details, please contact: www.mobilcrane.com by clicking HERE. repair and problem-solving, all in one web-site. Enter Alatas Limited Crane Service Worldwide. Repair/problem-solving, don't leave this site, just enter HERE! All information in www.mobilcrane.com may be used by anyone, free of charge. 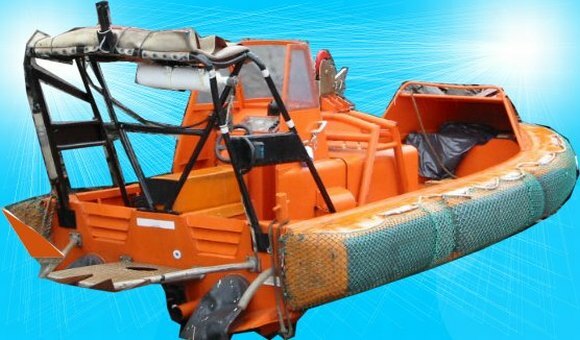 www.mobilcrane.com can not be held responsible for any mistakes caused by use of any information in this web-site, the information is ment as counselling service. However, all information will be in a high standard. Mobilcrane.com has now been visited by 100 country's, check it out HERE. This web-site has been opened more than 150.000 times since it was established 16 May 2003.